Swift Current, Sask. – For the first time since 1993, the Swift Current Broncos are Western Hockey League Champions. With a 3-0 win over the Everett Silvertips in Game 6 of the 2018 Rogers WHL Championship Series, the Swift Current Broncos claimed the franchise’s third championship in WHL history, following in the footsteps of the 1988-89 and 1992-93 Broncos. “I’m so proud of our kids – it’s all about the kids,” said Manny Viveiros, head coach of the Broncos. “The way they worked all season long, especially throughout the playoffs here – it’s quite a grind with the amount of games we play – but these kids never gave up, they kept working and working. I’m really proud of them. Broncos captain Glenn Gawdin (Calgary Flames) was named 2018 WHL Playoffs MVP, registering 32 points (14G-18A) in 24 games to lead his team in scoring. “I’ve been waiting five years for this moment,” Gawdin said. “How I’m feeling is tough to put into words, but it was worth the wait. Overage forward Giorgio Estephan scored the Ed Chynoweth Cup-clinching goal early in the first period, putting a power-play goal past Silvertips goaltender Carter Hart (Philadelphia Flyers). In net, Broncos goaltender Stuart Skinner (Edmonton Oilers) was perfect, making 31 saves to secure his WHL-leading sixth shutout of the 2018 WHL Playoffs. “I was just having fun out there,” Skinner said. “I was just doing my best to stop the puck. Obviously, I have an incredible team in front of me doing their job as well. It was a team effort. The team won the Cup… I got those shutouts because of the team and because the team worked so hard and because we’re such a tight family. That’s the reason why we won tonight and that’s the reason why I got a shutout tonight. “You can’t put anything like this into words. Being able to lift that Cup over my head and being able to do it front of all these fans… such a feeling. Like the five games before it, Game 6 back in Swift Current was brimming with nervous excitement from the opening puck drop. With 13:40 to play in the first period, the Broncos were given the first power play of the game as Silvertips forward Patrick Bajkov (Florida Panthers) was sent off for slashing. It only took 21 seconds for Estephan to blow the lid off the Innovation Credit Union i-Plex. Taking a feed from Aleksi Heponiemi (Florida Panthers) in the low slot, the overage forward had an open cage to easily deposit the puck into. With 13:19 to go in the first period, the Broncos were out in front by a 1-0 count. Though tense moments remained, that 1-0 score was enough for a stifling Broncos defense. With 0.6 seconds to go in the first period, the hosts received all their necessary insurance as Heponiemi put another past Hart. Parked on the doorstep, the Finnish forward scooped up a loose puck and swatted it past the Everett netminder, giving his team a 2-0 lead after 20 minutes of play. A scoreless second period bled into the third period as Everett’s desperation continued to rise. 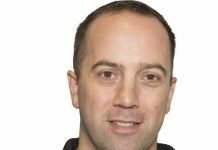 With time wearing thin, Silvertips head coach Dennis Williams opted to pull Hart in favour of the extra attacker. Though Everett owned the puck and sent shot after shot in on Skinner, the Edmonton product was tall to the task, slamming the door and preserving the 2-0 lead. With only four seconds to play, Broncos forward Beck Malenstyn (Washington Capitals) deposited one last puck into the vacated Everett cage and giving the home side a decisive 3-0 advantage. Hart finished the night with 22 saves on 24 shots. 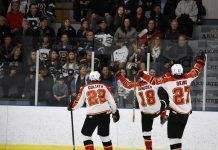 As the final buzzer sounded, the 2,890 in attendance at the Innovation Credit Union i-Plex erupted with a roar that could’ve been heard across the entire Western Hockey League. 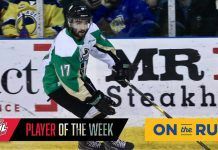 “It’s electrifying, it gets your heart pumping and it makes you love playing the game,” Estephan said of the Swift Current crowd. “They’re always by your side. Now, the Broncos head off to the 100th Mastercard Memorial Cup in Regina, joining the host Pats in representing the WHL in search of a national title. The Broncos and Pats will be joined by the Hamilton Bulldogs (Ontario Hockey League Champions) and Acadie-Bathurst Titan (Quebec Major Junior Hockey League Champions) in Regina, where the 100th Mastercard Memorial Cup runs from May 17 to 27. The last time the Broncos claimed a WHL Championship in 1993, they finished the 1992-93 WHL Regular Season atop the WHL’s Eastern Division with a record of 49-21-2 and 100 points. Though the 2017-18 edition of the Broncos may have claimed fewer victories, they managed a mark of 48-17-5-2 and 103 points. That effort serves as the second-best regular season in Broncos franchise history, with only the 1988-89 Swift Current Broncos (55-16-1, 111 points) etched ahead of the 2017-18 crew. Though the 1993 Broncos did not go on to claim a Memorial Cup Championship, the story differs greatly for the 1989 squad from Swift Current. Less than three years removed from a devastating bus crash that took the lives of four Broncos – Scott Kruger, Trent Kresse, Brent Ruff and Chris Mantyka – Swift Current claimed a WHL Championship before going on to win the 1989 Memorial Cup Championship, as Tim Tisdale scored the national title-winning goal. The WHL went on to name its regular season MVP trophy in memoriam of those lives lost – the Four Broncos Memorial Trophy is awarded annually to the WHL’s Player of the Year. While Gawdin led the 2018 Broncos in playoff scoring, it was Andy Schneider who posted the greatest point total back in 1993, notching 39 points (13G-26A) in only 17 games. That effort was good enough for Schneider, a product of Edmonton, to be recognized with MVP honours for the 1989 WHL Playoffs. In their own right, the 2018 Broncos will go into the WHL record books, having established a league record with 26 post-season games played. 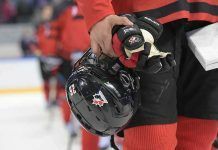 How did the 2018 Swift Current Broncos reach such a mark? 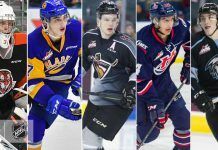 It took them seven games to defeat the Regina Pats in the opening round of the 2018 WHL Playoffs, followed by a second consecutive seven-game affair with the Scotty Munro Champion Moose Jaw Warriors. In claiming the Eastern Conference Championship, the Broncos needed six games to work past the Lethbridge Hurricanes and another six games to knock off the Silvertips in the Rogers WHL Championship Series. The 1986 Medicine Hat Tigers and 1979 Portland Winterhawks are the two teams to have previously seen 25 games worth of post-season action. In addition to winning their first WHL Championship since 1993, the Broncos are the first Saskatchewan-based WHL team to win the league title since 1993. In fact, the last three Saskatchewan-based WHL Champions come from Swift Current – 2018, 1993 and 1989. 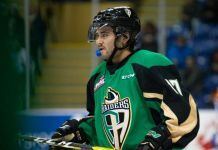 Beside the Broncos, the last Saskatchewan-based WHL Club to win a WHL Championship is the 1985 Prince Albert Raiders, which happened to boast the talents of Viveiros, who served as a defenceman for that squad.